Premium Cabinets of Oklahoma City offers the highest quality wood kitchen cabinets in the OK City region. We are a family owned & operated business in Edmond, OK. With in-house designers and a knowledgeable sales force, we are the best choice for a new kitchen or remodel. We are best known for our superior customer service. Which means we take the time to listen to each person’s unique wants and needs for their own cabinet design. In addition to superb cabinets, we offer a full line of flooring to complete the project. For the more rural areas in Oklahoma – as a convenience to our customers – we have a mobile showroom we can take to the project site full of cabinet door and flooring samples. 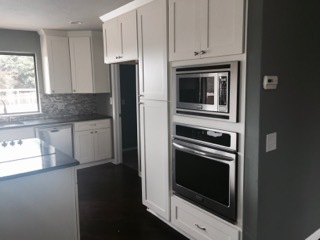 The cabinets at Premium Cabinets OKC offer superb features that cannot be found in our competitor’s cabinets. Our cabinets are all wood construction. The backs and sides of our cabinets are built with high quality premium birch plywood and the frame and doors are built with a beautiful maple wood. We never use MDF or particle board in our products. Our drawers are all wood boxes with dovetail joint construction. These joints are stronger and more durable than other constructions. All of our drawers and doors come standard with soft close glides – meaning they will gently close on their own without slamming or banging. Contact the Oklahoma City Cabinet Providers Today! Our showroom is located just outside Oklahoma City in Edmond, OK. Our expert cabinet team is here to help design your dream kitchen in a step-by-step process. We also have a mobile showroom as a convenience for our more rural customers. Contact us today to get started on designing your perfect kitchen! In addition to custom counter tops, we also do custom tables. If you want your company logo, family crest, or your ranches brand we can do it!